This exclusive, luxury, mountain condominium suite is uniquely located on the finest waterfront property on scenic Lake Dillon in the Heart of Colorado Ski Country. Just a short walk to the boat dock and marina and only steps to the lakeside outdoor ampitheater for awesome summer nights in the Rockies! Plus the absolute best location in Colorado for winter activities with seven great ski areas within only minutes... you can always find the ideal conditions... Vail/Beaver Creek, Copper Mountain, Breckenridge, Keystone, Arapahoe Basin, and Loveland. Snowboarding/skiing, snowmobiling, sledding, tubing, dinner sleigh rides, dog sled rides....we have it all! The unbelievable sweeping view of spectacular Lake Dillon set against the dramatic backdrop of the jagged snow-capped peaks of the Colorado Rockies from both your own spacious lakefront private deck and the master suite is world class! The incredible views of the lights of Keystone night skiing and the bright stars of the mountains unhampered by city lights will amaze you! Come breathe the fresh mountain air from 9000-plus feet! Downtown Dillon with its unique shops, theater, and excellent restaurants is within easy walking distance. Explore the nearby villages of Keystone, Frisco, Copper Mountain, and Vail which offer the charm of mountain living with their quaint shops and eateries. The village of Silverthorne with its numerous factory stores and unmatched recreation center is just down the street. There is so much to do and you are right in the center of it all! **Our suite, the Summit Suite can comfortably sleep 6-8 (6 beds) and offer the luxury and coziness of an unforgettable mountain experience- There is nothing like this in Summit County! Please call for more information. Our calendar changes daily. If you do not see availability for your dates please feel free to call or email. Log-beamed ceilings, flagstone floors, antler lamps, carved aspen wood and leather furnishings, custom-mountain appointments, plush comforters, and an inviting stone fireplace all create that high country atmosphere. A convenient and inviting heated indoor pool and an atrium housed hot tub with its own waterfall and mountain views will soothe your bones after a fun filled day in the high country! After a day of adventure in the Heart of the Majestic Colorado Rockies, come back to a cozy fire, the serenity of the breathtaking views, and the comfort of your mountain get-a-way. Enjoy a glass of wine and be intranced by the reflection of the moon across the glassy lake. 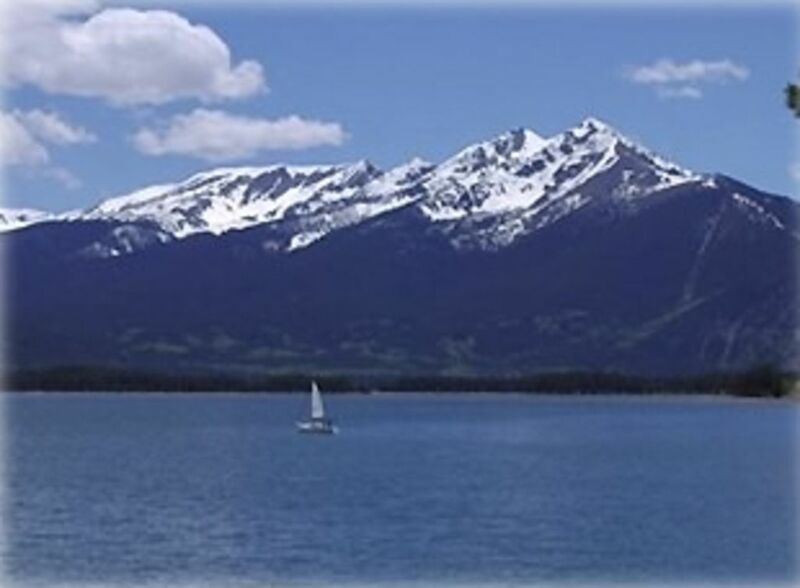 Clear your mind with that fresh mountain air, clear your soul with the splendor of the mountains, and experience the magic of the Colorado Rockies from the most premier waterfront location in Colorado...our lakefront suite at Point Dillon on beautiful Lake Dillon! Keywords: Uniquely Upscale Private Mountain Rustic Condominium right on the Lake, Spectacular Lake and Mountain Views, Luxury Accomodations, Custom Furninshings, Ideal Location, Unobstructed Panoramic Scenery, Walk to Dillon Marina, add the lockoff for a spacious and luxuriously grand 4 bedroom, 4 bath home stunning lakefront accomodation! I am an airline pilot for a major airline. Our main home is in Boulder, Colorado and Kona, Hawaii. We love Summit County and have enjoyed sharing our fabulous Dillon lakefront home with such wonderful guests over the years! This is one of the finest scenic views in Colorado. It is right on beautiful Lake Dillon with spectacular views of the Lake and the surrounding snow capped Rockies. Being in the center of seven different ski areas makes it a dream location in the winter. Being right on the lake and the bike path, near the Dillon Marina, Dillon Park and near the Ampitheater makes it a perfect location to enjoy the summer as well. This is an ideal location, right on the Lake with panoramic views. The extensive paved bike path passes right in front of us with trails to Keystone, Breck, Frisco, Copper and Vail. This gorgeous upscale mountain rustic condo is also just steps to the Dillon Ampitheater and the Dillon Marina as well as to the village of Dillon with its restaurants and shops. New remodeled luxury bathrooms with copper shower Spa panel, hand held shower and rain shower heads, glass doors and beautiful upscale tile. Just steps from Dillon town Center. Sweeping views of the famous Colorado Rockies including the Ten Mile range and Keystone mountain. Only 2 buildings on the Lake have unobstructed views. We are one of them. Only the 3rd and 4th floors offer the panoramic view of the 10 mile range and Keystone Mountain. Stroll from your suite to the water in just minutes. One of only two truely lakefront properties RIGHT ON THE LAKE with panoramic views of beautiful Lake Dillon and the surrounding snow-capped Colorado Rockies! No better view in Colorado!!! Spectacular unobstructed view of the surrounding Colorado Rockies! Views of Breckenridge and Keystone Ski areas right from your deck! Bed sheets, pillows and pillow cases, bath and kitchen towels are provided. Soap, shampoo, bath gel and an initial supply of paper products, dish and laundry soap provided. Built in washer in the condo. Laundry soap provided. Built in dryer in the condo. Dryer sheets provided. Remote opperated by switch on the wall. See info on placard in unit. 2 spaces for indoor parking. Two private indoor garage spaces provided for each unit! Beautiful cozy log cabin living room over looking Lake Dillon. Enjoy your front row seat to sailing regattas and fireworks! Refrigerator with built in cold water dispenser and ice dispenser. Built in brand new large microwave. Initial Supply of coffee, coffee filters, olive oil, foil, zip lock bags, salt and pepper. 12 place settings of 2 separate dining ware. Fully furnished kitchen with refrigerator, four top stove, oven, microwave, dishwasher, toaster, blender, crock pot, coffee machine and filters, foil, olive oil, zip lock bags and even spices! Formal rustic wood dinning room table seating 6 under an antler chandelier with 3 additional at the bar. Library of Books fro your enjoyment while sitting on the balcony enjoying the fresh mountain air. Very spacious deck with awesome views overlooking the lake and the surrounding Rockies with log table and chairs and log lounge chairs and built in BBQ. Indoor heated pool with two bathrooms and two shower/changing rooms! POINT DILLON-THE VERY FINEST PROPERTY ON THE LAKE! Exclusive Mountain Decor! Drop dead gorgeous! Beautiful Colorado Buff flagstone floors w/infloor heat, rustic granite countertops, elk pulls, travertine bath, carved aspen coat/towel racks, aged aspen log bar & wine hutch, snowshoe/antler wall sconces & chandelier, cedar log deck table & rockers, stainless steel built in BBQ w/stone buffet, and so much more, Spacious Luxury Accommodations. Exquisite Mountain Furnishings, Indoor Pool, Jacuzzi w/Waterfall, DVD/VCR/CD Stereo, ALL NEW furnished gourmet kitchen with, Ice/Cold Water Dispenser, MW, DW, Spices, Soaps & Shampoo!, 500 Cotton Count Linens, Washer/Dryer in Unit, 2 spot Indoor Garage, ELEVATOR! NO PETS, NO HOUSE PARTIES please! 7 AWESOME SKI AREAS - Vail/Beaver Creek, Copper Mountain, Breckenridge, Keystone, Arapahoe Basin, & Loveland! WINTERS, Romantic Sleigh Rides, Dog Sledding, Miles of Endless Cross Country Skiing, Ski, Snowshoe, Snowcat, Ice Skate, Snowmobile, Browse the Shops of the Quaint Mountain Villages, there is not a more ideal winter vacation spot in North America! SUMMERS, Lake Dillon offers Sailing, & Fishing within its 25 miles of Shoreline in a Picturesque Setting, Hike one of the hundreds of Mountain Trails, Try your hand at Fly-Fishing, Bike, Jog, or Rollerblade the Paved Path that passes through the property & extends for over 50 miles through the Mountains, Visit the Historic Gold Mining Towns & Gamble in Central City 'The Richest Square Mile on Earth, ' Golf the Courses of Trent Jones, Nicklaus, & Perry Dye, Gold Panning, Hay Rides, Ghost Towns, 4 Wheel-Driving, Jeeping, White-Water Rafting all await you!